I’m sure you’ll agree with me when I say the ability to engage, entertain, and inform an audience through public speaking is a skill that offers immense value in several different aspects. It’s a skill that you can use as the foundation for an incredibly successful career, as many public speakers are paid thousands of dollars or more for a single speaking engagement. Learning how to become a better public speaker is a valuable pursuit, whether you are wanting to pursue a career in public speaking or improve your public speaking skills in order to further your current career. And the best way – by far – to learn these skills is to take a public speaking course designed to teach you how to overcome your fears of public speaking and engage, entertain, and inform an audience all at the same time. Below, we’ll take a look at what public speaking courses are, the benefits that they offer, and how you can use these resources to become a better public speaker. What is a Public Speaking Course? Contrary to the belief of many, public speaking is a skill that can be learned. And as with any other skill, the best way to learn how to become a better public speaker is to find a great teacher. Public speaking courses offer you advice and resources put together by people who have already found success as a public speaker. These courses teach you everything you need to know to become a better public speaker, from how to overcome your fear of public speaking to strategies for making your speeches more engaging and entertaining to tips on where to find speaking engagements. They teach you how to make money as a public speaker. What is Taught in a Public Speaking Course? There’s a lot that goes into being an effective public speaker. Therefore, high-quality public speaking courses must cover a wide range of topics. These topics include things such as the basics and fundamentals of public speaking, how to overcome fears that will hold you back, how to let your personality shine through in your speech, and much more. A public speaking course will also give you advice on how to get started in public speaking and how to make a successful career out of it if that is your goal. Before diving into the finer details of public speaking, it’s important to first master the fundamentals. In my public speaking course “The 6-Figure Speaker”, these fundamentals form the basis to provide public speakers with a solid foundation to build upon as the course goes on. The importance of preparation and how to best prepare a speech that will wow your audience. How to overcome your fears of public speaking so that you can be calm and relaxed in front of a large crowd. The crucial role that body language plays in public speaking. How to persuade and inspire an audience with both your words and your stage presence. How to leverage eye contact to engage your audience and build trust. These comprise just a handful of the fundamentals of public speaking covered in this course, and each one is vitally important to your success as a public speaker. Once you have these fundamentals down, the further nuances of being a stellar public speaker that are also covered in the course will come easy. Knowing how to deliver a great speech is of little value if you don’t have any speaking engagements on your schedule. This is why in addition to teaching you how to be a great public speaker, “The 6-Figure Speaker” also teaches you where to find speaking opportunities, how to negotiate rates for your speaking engagements, how to use public speaking to grow your platform and more. “The 6-Figure Speaker” goes a step further than most every other public speaking course, not only teaching you how to become a better public speaker but also teaching you how to put your newfound skills to use in a real and practical way. Many people desire to use public speaking as a tool to grow their current career. This is definitely a great reason to pursue public speaking, however, there a plenty of others who make a career out of public speaking itself. Public speaking is a career that is full of opportunities. In fact, the United States Bureau of Labor Statistics predicts that the business of public speaking will grow 44% from 2010 to 2020 – outpacing the growth of all other careers combined. As the name of the course suggests, the goal of “The 6-Figure Speaker” is to teach you how to earn a 6-figure income entirely from your speaking engagements. Of course, the first step to earning a 6-figure income as a public speaker is to hone your public speaking skills to near perfection, and that’s certainly something that this course covers. In addition to teaching you the skills you need to command high rates as a public speaker, “The 6-Figure Speaker” also covers strategies you can use to start and build a public speaking career. These strategies include a blueprint for building your public speaking business, how to earn additional income from your speaking engagements on top of your fees, where to find the best opportunities for high-paying speaking engagements, and much more. A career in public speaking offers tons of benefits, from high pay to the ability to travel the world and be your own boss. If you are serious about starting a rewarding career as a public speaker then “The 6-Figure Speaker” is the perfect course for you. By far, the biggest obstacle keeping people from pursuing public speaking is fear. In fact, one survey shows that 54% of adults fear public speaking more than death itself! “The only thing we have to fear is fear itself”. There is no risk or danger in public speaking – only the potential for reward. Once you overcome your fear of public speaking, you’ll be amazed at how much of a better public speaker you become. Even if you fight back your fear and get on stage regardless of it, a fear of public speaking can still make you appear nervous to your audience and keep you from reaching your full potential. This is why I cover in-depth how to completely overcome a fear of public speaking in “The 6-Figure Speaker”. If you’re ready to start your journey toward becoming a better public speaker right away, there are plenty of great tips that you can put into practice right now. Ideally, there’s at least one subject that you consider yourself an expert on and feel that you have a lot of valuable info on that subject to share. Once you’ve identified the subject you’d like to speak on, focus only on it and avoid the temptation to try and be a “Jack of all trades” speaker. In public speaking, it’s much better to become known as an expert in a single area than to be known as adequate in many areas. If you can make helping others your genuine goal in public speaking, you’ll go far. Identify the needs and pain points of your audience and figure out how to address them. If all you do is provide people with a solution that they have been looking for through the words you speak, the rest will fall into place. In the beginning, you should capitalize on every speaking opportunity that comes your way regardless of the size of the audience or how much it pays. Taking on every speaking engagement that you can enable you to both hone your skills and grow your recognition – two things that are highly important in a public speaking career. Passion is contagious. If you can speak on a subject that you are truly passionate about and convey that passion in your speech, your audience will be likely to share your passion and walk away feeling inspired by your speech. There are plenty of great tips such as these that you can use to start becoming a better public speaker today. Ultimately, though, the best way to learn everything you need to know to succeed as a public speaker – including guidance that goes far deeper than the public speaking tips you find for free on the internet – is to take a high-quality public speaking course. There are a lot of different roads that all lead to a successful public speaking career. For myself, there was a time when I had no idea how to speak in front of large crowds. Once I realized that public speaking was the best way to promote my books and grow my brand, though, I began speaking at events across North America. Soon, I decided to start speaking at international events, starting with Germany. As of today, I’ve now spoken in 75 different countries and am looking to grow that number even more. Everyone’s path to a successful public speaking career is different, and there is no right or wrong way to get into public speaking. No matter what path you take, though, the first step is always going to be building your public speaking skills. If at this point you’ve decided that attending a public speaking course is the best way to begin your public speaking career, you’ve got plenty of great options to choose from. In addition to “The 6-Figure Speaker”, I also offer plenty of free resources on public speaking such as videos and articles that you can use to begin building your public speaking skills. If you would like hands-on training in public speaking, you may want to attend my “Speaking Academy” in-person, 3-day course. This intimate workshop-style training takes place in San Diego, CA and is limited to just twelve attendees – all of whom will receive my full attention while we work on intensive training exercises designed to let you walk away a better public speaker than you would have ever thought possible. If you want to learn how to become a better public speaker without ever having to leave the comfort of your own home, you’re in luck; “The 6-Figure Speaker” is an entirely-online course that is packed full of tips and wisdom that I have learned over a lifetime of public speaking. While succeeding as a public speaker will require you to venture out into the world, learning the knowledge necessary to succeed as a public speaker does not require you to ever leave your home thanks to online public speaking courses such as “The 6-Figure Speaker”. Is fear the only obstacle that is preventing you from becoming a successful public speaker? If so, you may benefit from a public speaking course that focuses heavily on overcoming the fear of public speaking. In “The 6-Figure Speaker”, overcoming fears is thoroughly covered, making this course great for anyone who wants to get past their fear of public speaking. Nothing beats hands-on training when it comes to learning how to become a better public speaker. If you want to best of the best training available today to start you out in your public speaking career, my “Speaking Academy” workshop is the perfect solution. This workshop is the top-of-the-line public speaking training that I have to offer, and it’s meant for individuals who are serious about building a highly successful public speaking career. If you’re looking for the best training that money can buy, “Speaking Academy” is the event to attend. Learning how to become a better public speaker is a valuable pursuit and can be done quickly through public speaking courses. 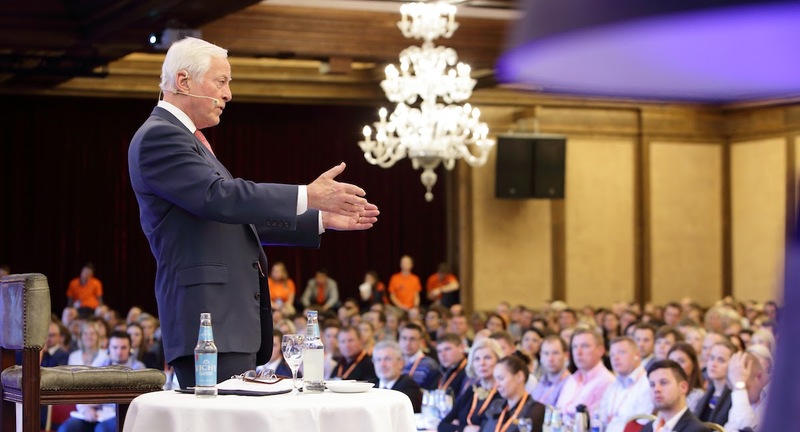 Learn more from expert Brian Tracy.